A wise pit-stop strategy enabled Jake Dennis to vault to ninth position in the second and main race of the Blancpain GT Series Sprint Cup event at Brands Hatch GP in Great Britain. 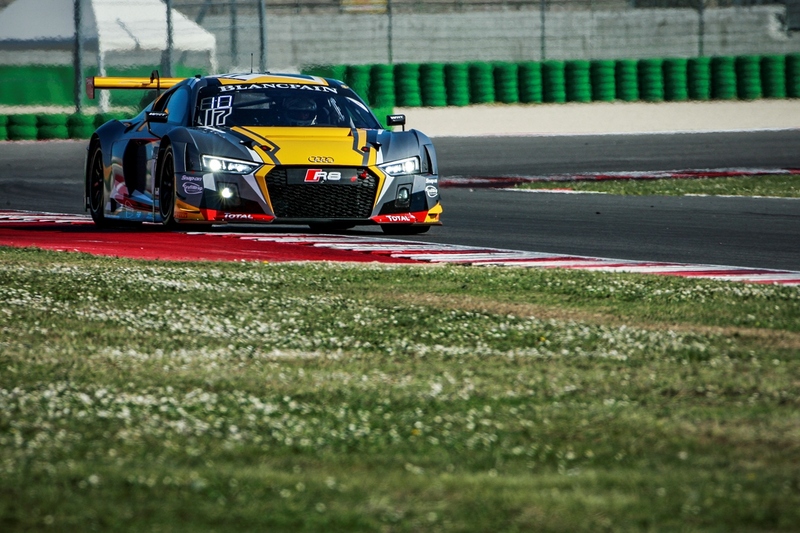 The Racing Steps Foundation-backed driver and team-mate Pieter Schothorst, who earlier finished 13th in the first race of the weekend in their Team WRT-run Audi R8 LMS, remained in their position on the opening laps before a safety car was required to clear the stranded #75 Audi R8 LMS after it became beached in the gravel at Sterlings. With Schothorst remaining in 13th position on the restart, he remained in the car and despite the pit window opening with 35 minutes remaining, he continued to circulate as those cars around him headed into the pits to switch driver and a new set of tyres. Fellow RSF-backed driver Ben Barnicoat and Strakka Racing McLaren 650 S GT3 team-mate Alvaro Parente began the race from sixth position following their earlier excellent result in the opening race. Having started the race, Barnicoat maintained his position with five cars nose-to-tail battling for second position with the #58 McLaren at the tail of the group. Barnicoat eventually progressed up the inside of Antonio Felix da Costa’s #99 BMW M6 GT3 at Graham Hill Bend with 43 minutes remaining before handing over to Parente at the first opportunity upon the opening of the pit window. However a slow pit-stop de-railed the car’s progress, with Parente returning to the track in 12th position. Schothorst eventually did make his pit stop towards the end of the pit window, the team making an excellent turnaround as Dennis stepped into the car and returning back on to the track in 10th place. With Parente passing the fellow Strakka Racing #42 McLaren 650 S GT3 machine of Lewis Williamson, he was unable to pass Dennis with no further position changes before the chequered flag. Following the end of the race however, the provisionally fourth placed #85 HTP Mercedes-AMG GT3 of Fabian Schiller was handed a penalty, demoting the car to outside the top 10 spots, and promoting Schothorst and Dennis to ninth, with Barnicoat and Parente taking 10th. “WRT are very good in the pit stops, we always make up several places in the pit window,” Dennis said. “That’s exactly what happened today. We actually wanted to pit earlier but couldn’t as I was the quicker driver and had new tyres but it wasn’t possible as the other WRT cars were in the pits. “Overall, I’m happy to be back in the points after a difficult Monza weekend [the previous weekend in the FIA Formula 3 European Championship]. Barnicoat was left disappointed after positive results earlier in the weekend: “Being on the outside of the grid at the race start, I was able to safely negotiate the opening turns and it began to bottle up so felt confident to push on from there. “I was very happy with my stint, and in hindsight the decision to box very early may not have been the best as we should have looked to make up some extra ground. “But the pit stop took around 15 seconds too long. That was game over really as it’s such a difficult track to overtake around. Finishing 10th was a great shame as we certainly could have taken a podium.